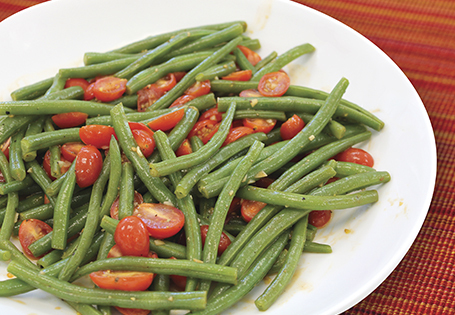 Place green beans in water and cook for 3 minutes, drain and immediately place in a large bowl of ice water. Drain and pat dry. In a skillet, heat oil over medium heat. Add green beans, garlic and tomatoes. Season with salt and 1 teaspoon pepper. Sauté for 5 minutes or until beans are al dente. Whisk drippings with mustard, vinegar, honey and remaining teaspoon of pepper. Pour over beans and toss to coat. Serve immediately.